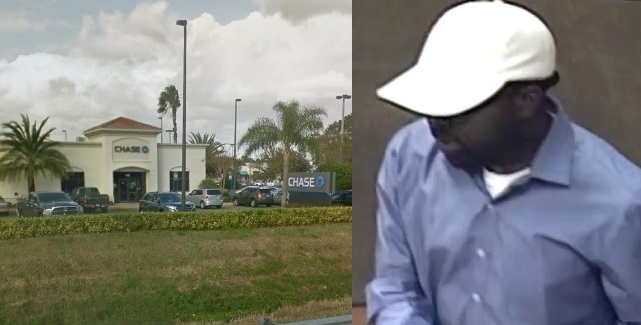 WEST MELBOURNE, Florida - At approximately 6 p.m. on Thursday, April 13, 2017, West Melbourne Police responded to a robbery at the Chase bank located at 115 Palm Bay Road in West Melbourne, Florida. Police say that a man entered the Chase lobby and advised the bank teller that he would like to make a withdrawal. A note was then passed to the teller advising her that he had a gun and that the teller was to give him money in $100’s only. The bank teller complied and an unknown amount of money was given to the suspect. According to police, the bank robber left the bank without displaying a gun or harming anyone. The robbery suspect is described as a dark skinned black male possibly in his 30’s with goatee facial hair. He was last seen wearing wire framed glasses, a white hat, a blue long sleeve button up shirt, jeans, and white shoes. If you recognize this suspect, or have additional information regarding the bank robbery, please contact the West Melbourne Police Department.